The answer is yes, they can. As long as the mortgage company follows the rules. Let’s take a moment to define some terms, though. When we’re talking about the first mortgage company, we’re talking about the main mortgage for your home. Sometimes, people decide to get another mortgage on top of that. That second mortgage is also tied to the house you bought. When you’re dealing with a foreclosure, it’s usually with the first mortgage company. 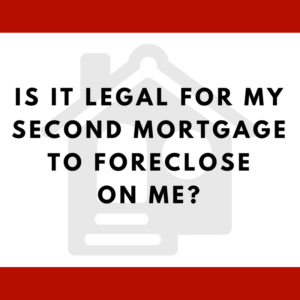 However, sometimes it’s the second mortgage that can cause the foreclosure. Let’s talk about how the second mortgage can go about foreclosing on you. In order to foreclose on you, the mortgage company has to pay off the first mortgage with the proceeds of the foreclosure sale. After they pay off the first mortgage, then the money from the sale would go towards the actual debt of the second mortgage. It’s unusual for this to happen, but we’re seeing second mortgages foreclosing on consumers more often. You may remember the recession from 2007/2008, and maybe even took out a second mortgage before the recession. Some people may have stopped paying their second mortgage, and now that it’s been 10 years the ownership of the second mortgage has changed hands. Sometimes multiple times. So you may not know who they are, but the mortgage company will call you up and say that they’re foreclosing on you. Some people will tell you that the second mortgage can’t do anything. They’re wrong. If you have any questions and you live in Alabama, give us a call. We would be glad to help you figure out what would be best for your unique situation. We have repeatedly stopped second mortgage companies from foreclosing as they routinely break the law. We’ll help you look at your situation to see if your second mortgage company is following the law or breaking the law. PS: Here are some articles that might help you as you do your research. Normally, a mortgage company that pops up after years of not hearing from them are considered debt collectors under the FDCPA. It is mission critical to look at your mortgage and also at the default letter. Remember the power of the federal law RESPA and FCRA when dealing with a foreclosure or threatened foreclosure. What about a “rehab loan” via USDA that has a lien against my home attached to it? I have a mortgage so it was my understanding they were 2nd in line. They’ve reported as a foreclosure after 8 yrs, but I never received anything stating that. The house can’t be lived in because of mold coming about from a leaky pond on a neighbors property. I’ve only recently stopped paying after 18 yrs and $80,000.00 worth of pmts on a 40k home on one acre. I’m working with the mortgage company in hopes of a “deed in lieu” agreement. Can the USDA actually post it as foreclosure on my credit for non payment of a rehab loan, where they’ve simply placed a lien? I’m assuming you are in Alabama — if another state then you’ll need to get with a lawyer there. In Alabama, it should not be showing as a foreclosure unless it has actually been foreclosed. To be foreclosed, you have to be notified and then it has to be sold during legal hours at the front entrance to the courthouse. Check your probate court to see if any foreclosure deed has been filed. Did you stop paying on it 8 years ago? Or they are saying they foreclosed 8 years ago? Sorry you are having such bad issues with mold, etc. Call us if in Alabama — we’ll see what we can do to help you with USDA — 205-879-2447.